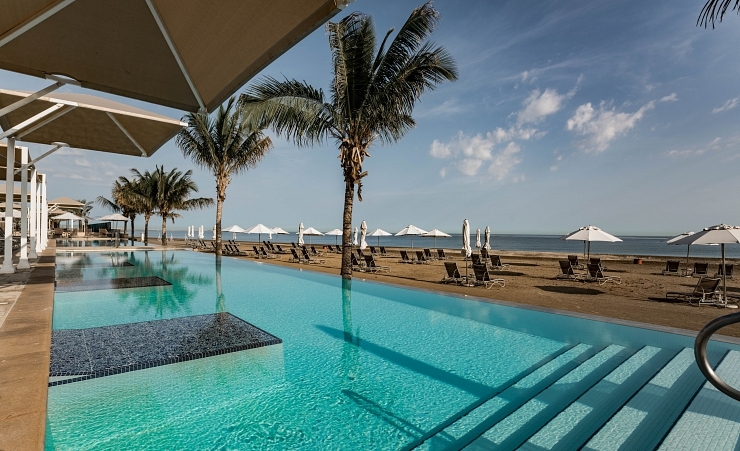 Situated an hour's drive north of the capital, Mussanah is a purpose-built beach resort sandwiched between the Hajar Mountains and the Gulf of Oman. Sun worshippers will enjoy the endless stretches of sandy beach, bordered by the pristine warm waters. Avoiding the unbearable heat between June and August would be best advised, prone as they are to soaring temperatures in the high-30s and low-40s. For ideal temperatures that are pleasant and warm during the daytime and mild, even a little chilly, in the evening, October through to April are the times you should be looking at. Holidays to Mussanah are all about relaxing and unwinding. The attractive beach location is just perfect for kicking back and enjoying the peaceful and pleasant surroundings. Taking a daytrip to Muscat, the country’s capital, should also be high-up on your itinerary, should the urge to get out and explore grip you. There is plenty to see and do in this historic city, but the best way to fit it all into one trip is to participate in the Muscat City Tour. Settled between Sohar and Barka, the beach resort is located on the Gulf of Oman. It is a stunning strip of coastline, with some spots offering striking views of the Al Hajar Mountains and the nearby marina has an appealing selection of water sports. One of the largest resorts in the area, the Millennium Resort has a handful of dining options, including the international cuisine served in Mydan, the Mediterranean Azure and local a la carte dishes in Al Bahar. As well as that, there are a few other bars and lounges that offer food menus. Be sure, when possible, to try some of the local Omani dishes, which you will find infused with wonderful flavours and aromas such as cardamom and turmeric. Alcohol consumption is restricted in Oman, so there’s nowhere around that’ll allow you to purchase any alcoholic beverages “over-the-counter” (unless you hold a resident’s permit). The upmarket restaurants and hotel bars will be able to provide alcoholic drinks however, provided they are consumed upon the premises. This area has been culturally important, due to its location, for centuries, evidenced by the many forts and other historic buildings such as the Al Masnaah Fort found nearby. It is one of the most famous and largest fortresses found anywhere in the country, built during the reign of Imam Ahmad bin Said Al Busaidi. In Muscat, tours taking in the Sultan Qaboos Mosque, the Fish Souq and Muttrah Souq, to name just a few of the sights, are well worth the sojourn to the capital city. The protected nature reserve of Damaniyat Islands and the boat trip there makes for a cracking day out. The colourful reefs and crystal-clear waters provide a beautiful area for you to explore by diving or snorkelling. It’s also quite common to encounter turtles and exotic schools of fish. Public transport isn’t the best, so buses will, at best, get you from one major town to another. Taxis can be sourced by speaking to reception at your resort but being outside of the city will limit options. The rugged landscape and dramatic coastline (not to mention the restriction of alcoholic temptations) make for a perfect opportunity to hire a car and explore the area at your own leisure.